Finnair has launched its first fully-flat bed in business class, with an innovative layout that means a third of passengers will enjoy a seat by itself, with no passenger either side. The new Contour Vantage seat has been fitted to the carrier’s fifth Airbus A330, and is a departure from the Recaro angled lie-flat offering available on Finnair’s first four A330s (along with its A340 fleet). The unusual layout means that 90 per cent of seats have direct aisle access, and one third of the seats have been positioned so that there is no seat next to them, which will undoubtdely be sought after by business travellers looking for in-flight privacy. The configuration also means that Finnair has actually been able to slightly increase the number of seats in business class, from 42 to 45 seats, while at the same time moving to a fully-flat offering. 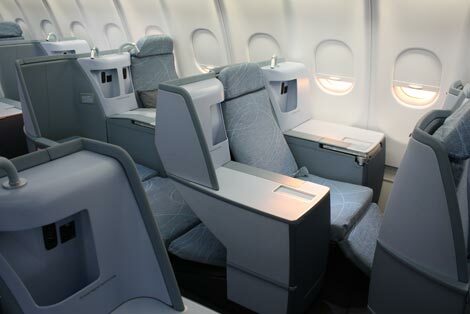 Swiss was the first to fit this layout using the Contour Vantage seat (see online news May 22, 2008), and is currently retrofitting its A340 aircraft with the product, as well as fitting the seat on its new A330s. Finnair uses its A330 aircraft on routes including New York, Delhi, Seoul and Nagoya. For more information visit finnair.com. UPDATE: Eurostar "steadily managing backlog of passengers"